Three tape Series Nearly 6-hours of Seminar material. We first study the little-known fact that the supernatural battle for America's soul between God and Satan began in the 1740's. Satan began to instruct his Guiding Spirits to tell the key human leaders of European and British secret societies that they were to make every effort to capture the new North American Continent for Lucifer. 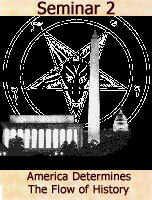 They were to establish America as the nation that would lead the world into the Kingdom of Antichrist [New World Order] over the next two centuries. However, God began His Great Awakening Revival in the same period of time, causing it to spread all throughout the American Colonies. Some historians feel that, by the time of the American Revolution of 1776, close to one-half the American citizens claimed Jesus Christ as Savior. As a result, Satan was able to place most of the political and business leaders to carry out his plan, while God had the hearts of the people and many influential spiritual leaders.